New York provides some of the strongest laws protecting independent contractors in the country. Independent contractor rights include law protects workers from misclassification, and wrongfully classified employees are eligible for unpaid wages and other denied benefits. In addition, independent contractors have strong protections under New York City’s Freelance Isn’t Free Act. It is against the law for employers to illegally misclassify a worker as independent contractor rather than an employee. 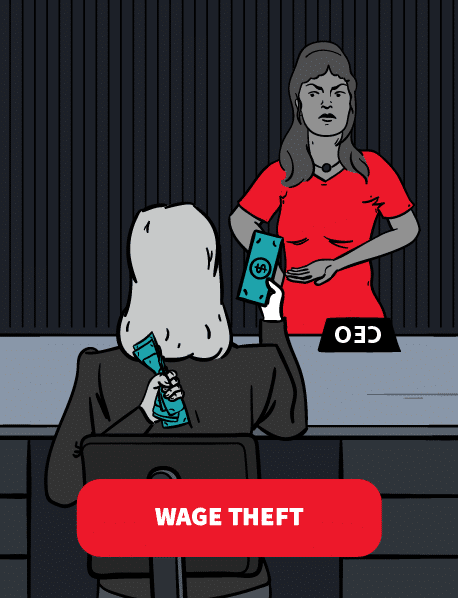 Yet many companies violate this law, which is a form of wage theft. Learn about independent contractor rights and reach out to a New York employment lawyer for a free consultation. It is cheaper for a company to illegally misclassify you as an independent contractor rather than an employee. Employers don’t have to provide independent contractors with overtime pay or even pay the minimum wage. They can also avoid having to pay Social Security and Medicare taxes, unemployment insurance, disability insurance, and workers’ compensation insurance if a worker is classified as an independent contractor rather than an employee. Misclassification of employees is a major problem––it deprives workers of wages and benefits which they are legally owed. If you have been illegally misclassified as an independent contractor, you are protected under federal, New York state, and New York City laws. A New York employment lawyer can protect your rights. The question of who counts as an independent contractor is complex and depends on several factors. However, because the wage-hour laws were enacted to protect employees from being cheated by their employers, the term “employee” is broadly interpreted under the law. There are several factors that define independent contractors. Typically, you are not considered an employee if you have your own business in which you advertise your services to the public, print your own business cards, hire other employees, pay your own expenses, or have a dedicated place of business away from your employer. You are usually considered an employee if you receive a salary, are paid by the hour, or you earn a draw against future commissions (with no need to repay unearned commissions). There are a number of other factors courts look at in deciding whether a worker is an independent contractor or an employee. Nearly all of your income comes from one company. The work is long term/permanent as opposed to temporary. The work performed is an integral part of the employer’s business––your work is what the company does. You are not permitted to subcontract out any of the work for this employer, and must do your own tasks. The work does not require highly specialized skills. The employer has a lot of supervision and control over how you do your job. You are not free to take on other work from competitive businesses. You receive fringe benefits, such as medical and dental insurance, use of a company car, housing allowance, educational assistance, vacation pay, sick pay, meals, or employee discounts. The employer requires that you work on a fixed schedule and you cannot set your own hours. You are on the company’s payroll. You do not pay your own expenses. The employer does not permit you to refuse to do a task. Your employer requires your attendance at meetings and/or training. Your employer provides facilities, equipment, tools, or supplies to help you do the work. The company gave you business cards. The company requires you to submit oral or written reports. Courts use these questions to determine whether someone is operating as an independent contractor or an employee. This distinction may require employers to provide minimum wage and benefits. No one factor governs the analysis, but if you are part of a group doing roughly the same thing for your employer, it is likely that you are an employee. Just because your employer says you are an independent contractor does not make them right. Employers often misclassify employees as independent contractors. You may still be an employee rather than an independent contractor, even if you have been misclassified by your employer, who pays you as an independent contractor. Receiving a 1099 form rather than a W-2 to list your income does not automatically make you an independent contractor. Employers cannot ask you to waive any rights you have as an employee, including forcing you to sign a statement that you are an independent contractor. Employers cannot require you to file as a sole proprietor or small business, or obtain a “doing business as” permit, in order to work for them. If you are misclassified as an independent contractor when you actually are an employee, you can sue your employer for damages. This is true whether or not the misclassification was deliberate. Ignorance of the law is not a legal defense. Employers are legally obligated to give their employees written notice and a wage statement. Before you begin working, your employer must provide written notice of your rate of pay, the employer’s legal business name, and other information. This notice must be written in both English and whatever language you speak as your primary language. Also, your employer must get your signed acknowledgment that you received the written notice. Employers are required to keep your signed acknowledgement on file for at least six years, just like other payroll files. If your employer fails to provide written notice, they must pay you $50 for each workday that passes without giving you the notice, up to a maximum of $5,000 for each year of employment. Similarly, your employer must provide a wage statement, or pay stub, for each pay period. This must list the period of time covered, the rate of pay, the number of hours worked, and any deductions made from your pay. If your employer fails to provide you with a wage statement, or if the statement is inaccurate, you can collect $250 for each day the violation continues, up to a maximum of $5,000 per year of employment. Thus, in addition to double damage for unpaid overtime, you may be entitled to an additional $10,000 per year of employment. Independent contractors are not covered by the minimum wage or overtime rules, but if you should have been classified as an employee, the damages for misclassification include unpaid wages just as if you were an employee. If the amount you were paid divided by the hours you worked adds up to less than the minimum wage, you are entitled to the difference. If you ever worked more than 40 hours in a work week, you are entitled to overtime pay at the rate of one and a half times your regular rate of pay. Also, as an employee in New York, you are entitled to an extra hour of pay at the minimum wage when you work ten hours or more during a work day. You have two options for recovering unpaid wages. You can file a wage claim with the New York Department of Labor, which will investigate your claim, hold a hearing, and help you recover any wages that are owed. Alternatively, you can file a lawsuit in court. You do not have to retain a lawyer to pursue either option, although maneuvering a case through the courts is a more complicated process than filing with the Department of Labor. However, if you do retain an attorney, both the FLSA and NYLL require that your employer pay your attorney fees if you are successful on your wage claim. Depending on how much you are owed, you may be well advised to talk with an attorney who will seek to recover your maximum damages under all governing laws. You have six years to file a wage claim under state law but only two years to file under federal law (or three years if your employer willfully violated the law). Not only can you recover your unpaid wages, but you also can receive “liquidated damages.” An award of liquidated damages is equal to the amount you are owed in unpaid wages, thus giving you double damages. For example, if your employer failed to pay you $5,000 in minimum wage and overtime, you can receive an additional $5,000 as liquidated damages, for a total of $10,000 plus interest and attorney fees. Although both federal and state law permit you to recover liquidated damages, you cannot collect under both. In New York City, the Freelance Isn’t Free Act protects freelancers and independent contractors. It applies to individuals hired or retained for pay. The law requires a contract for work of $800 or more. If the hiring party does not provide a valid contract, they must pay $250 for each violation of the contract requirement. Freelancers must be paid by the due date on the contract or within 30 days of completing the services. Hiring parties also cannot try to renegotiate the contract to pay less than the agreed rate. If hiring parties violate the Freelance Isn’t Free Act, independent contractors can sue for double damages. This means independent contractors can receive two times what they were owed on the contract if the client refuses to pay. The Freelance Isn’t Free Act also protects freelancers who face retaliation, harassment, intimidation, or other threatening behavior. Freelancers can sue for one times the value of the contract for each act of retaliation. Freelancers can file a complaint for nonpayment, underpayment, or retaliation for up to six years. A New York independent contractor attorney can help protect your rights. Learn more about the Freelance Isn’t Free Act or contact Charles Joseph for a free consultation.